Are you sick of seeing the same mass produced cheap cufflinks in the shops? Would you like something a wee bit different? 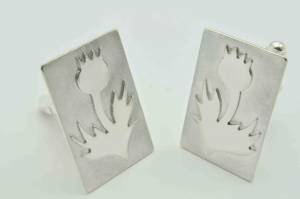 Well check out my online jewellery shop for individually handmade designer cufflinks made in silver. I also make cufflinks to order. Do you have your own ideas? Would you like your teams logo? Your favourite band? or theme of your hobby made into cufflinks? In the past, I have made lion rampants, saltires, welsh dragons, golf balls and thistle cufflinks. These are just a small selection of designs which can be made. 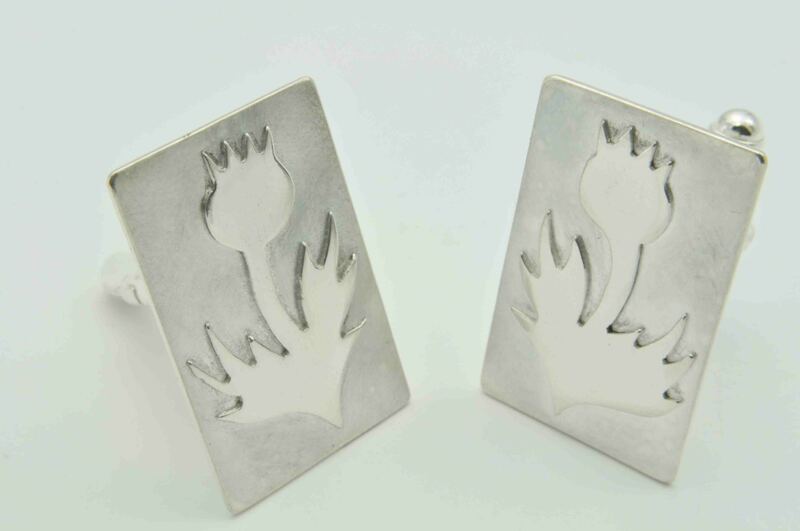 A client asked me to make a set of thistle cufflinks for a leaving gift for their colleague at work. Here is the process of making the cufflinks. First of all, I draw the size of the whole cufflink dimension, then sketch a thistle into the shape. This is then transferred on to the silver sheet and is carefully hand-pierced out with a jewellers saw. The edges are filed and shaped, then the two layers are soldered together and the cufflink components are soldered onto the other side. They are then put in the pickle, cleaned up and finally polished. I decided to give them a matt background and polished up the thistle layer to make the detail stand out more and give them contrast.